Our range of LED Dance Floors (Standard & Interchange) are manufactured in the heart of the West Midlands at our factory based in Halesowen. 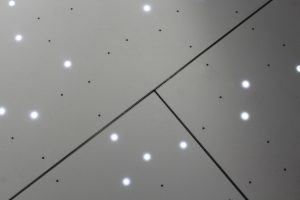 Each LED Dance Floor is hand crafted by a dedicated team of dance floor experts. 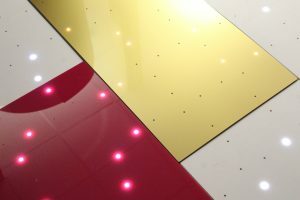 Our Dance Floors have been manufactured to combat issues in the current dance floor market and include exclusive features such as spring loaded clips, replaceable LED bulbs, and even our interchange colour feature, available with our interchange range. Our LED dance floors are made from a combination of strong foamboard and acrylic to ensure that they are sturdy, and lightweight too! Our extensive testing showed that dance floors made from a wooden base are prone to bend, and even break in certain temperatures. Our LED Dance floors all come with a 12 month guarantee. Our most popular size 16ft x 16ft LED Dance Floor, can be assembled in roughly around 25 minutes. This means it is quick enough to be laid down during a wedding reception if required. Exclusive to our LED Dance Floors, all bulbs are easily accessible, so that if one bulb blows, you can simply replace it! This is unlike other dance floors way you may need to replace the entire tile. It shouldn’t cost you any more than £2 to replace a broken bulb! LED Dance Floor available in any size, any colour. 1 fixed colour option. Sparkling LED in White or RGB. Black LED Dance Floor available in any size, with multi coloured RGB LED Lights. Change your lights with a mobile phone or portable device using our exclusive Wi-Fi software. LED Dance Floor available in any size, any colour. Swap & select colour option.